This noon I finally got around to updating my workshops for February. I posted them in the Events & Workshops tab (above) and on my website if you are interested. Last Saturday, I taught a furniture painting/3 technique workshop to Janice, a very lovely and very creative woman. She decided to paint a shelf in Provence with the Rustic Waxed technique. I love the way the color looks with a rustic finish and the dark wax. Beautiful! Janice loved her results, and so did I! Around 4:00 pm, closing time, I was feeling very feverish and weak. Little did I know I was consumed with this awful, torturous flu. I have honestly never, ever had a flu that was unrelenting in its grip. I have been in bed all week, still am, and tonight I still am fighting a semi-high fever. I cannot get it to go away! Just when I think I might be getting better and I go downstairs "pretending" I am well, it is within a matter of minutes I am back in bed. Some of you may know I have three cats. They all have loved having me home. For a person who never takes a nap, they all think this is such a marvelous change in their lives. 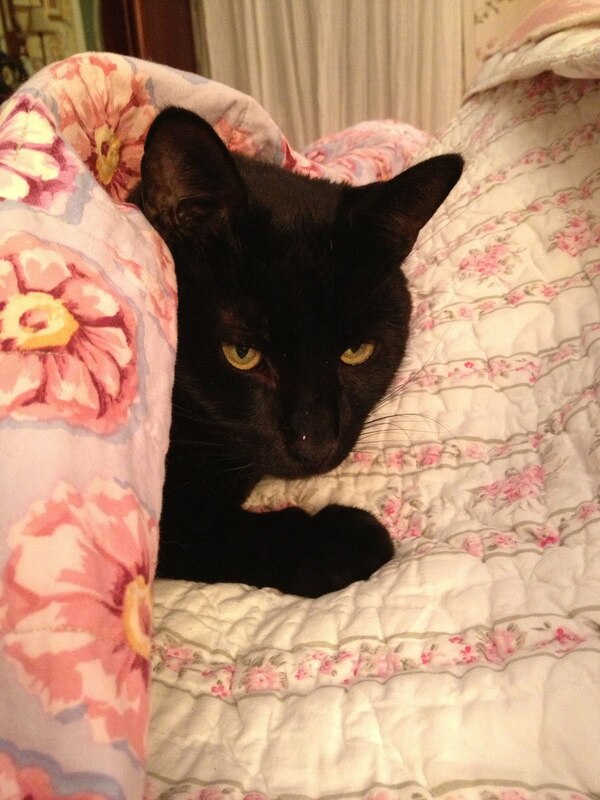 No only am I home, I am in bed constantly! They are in for a jolt when I finally get back on my feet because I am never one to sit still unless I am sitting by the fire reading a book. And then they invariably find my lap a nice place to be cozy as long as I am residing there. This is my man, Solon, the one who has greeted and helped anyone who walked in the door all week. He has the perfect Southern hospitable manner, bar none, and patience galore. I have to thank him here in this forum because many of my customers read this blog. I had originally hoped to get to my shop no later than Wednesday, but little did I realize the fierceness of this virus. Now I am shooting for Tuesday. I hope I make it. Solon needs a break too! Thank you for all your patience in my absence. When I was thinking about taking the holiday decorations down and settling into the new year for the new location (which I love by the way), I was thinking about white and snow and lights reflected in that magical winter light. I grew up, for the most influential part of my childhood, in Massena, New York, a small town near the Canadian border where it could start snowing around Halloween and begin a melt down in late April. Now, living in a milder climate for the majority of my adult life, I never seem to get over the longing for this magical snowy existence and beauty. So after I took the tree down and all the decorations, I decided a snowy existence or a semblance of one, was just what I needed for a transition from holiday to winter. This last Thursday when I was in my front room restocking paint, I heard some young boys walking home from school with a question...."why is that store all white?" I had to laugh. Well, I guess I did get my point across. I love ambient light in a room and this was a chance to show one of my lampshades that I made and soon will be featured in a class with Annie Sloan's beautiful fabrics! I love the store at night just when I am ready to shut off the lights and lock the door. I always leave three lamps on so people can peek in and wonder what is there on the shelves and way beyond. I think we all love to walk in our neighborhoods at night and peek into windows to see how people decorate and live their lives. One discussion I had with my husband and a customer this last week was of past memories. We all recalled when January was a month when all of the department stores featured "white sales", and then in February there were the men's suit sales around the President's birthdays. In March everyone looked forward to appliance sales. I think these indelible memories for many much younger are long forgotten. We are nearly to another holiday, Valentine's Day. I am hard-pressed to give up my white decor right now, but I may hang a few Valentine hearts somewhere in the shop. For now I am enjoying the imaginary beauty of snowflakes and magical light cast on snow at twilight. There really is nothing more beautiful. There is something about January and the adjustment of being so busy in December and the holiday tempo that makes it seem a little forlorn. Leaving my grandchildren is always hard and it never seems to get any easier even as some of them are reaching their teens. 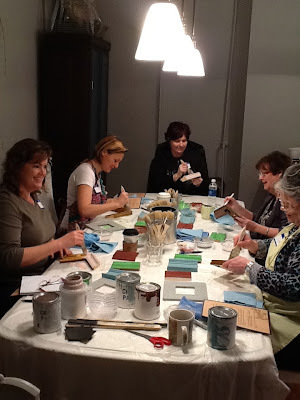 It was a nice boost this year to return to my fairly new location and shop and plunge right into a workshop with inspiring and energetic women. What a fun way to begin a new year. What I love best about workshops is the mingling of mutual passions and ideas and ways to hunt for bargains whether it be furniture or hardware. There is always someone in the group who has a secret way to find the best deal. Everyone talks about design, color, and technique in a refreshing and sharing manner. We all love paint and being creative, but we also love a chance to share and know we all belong to a mutual group that loves design and improvement and recycling neglected pieces of furniture. After we were done painting our wood samples, we decided to try painting some metal hooks. 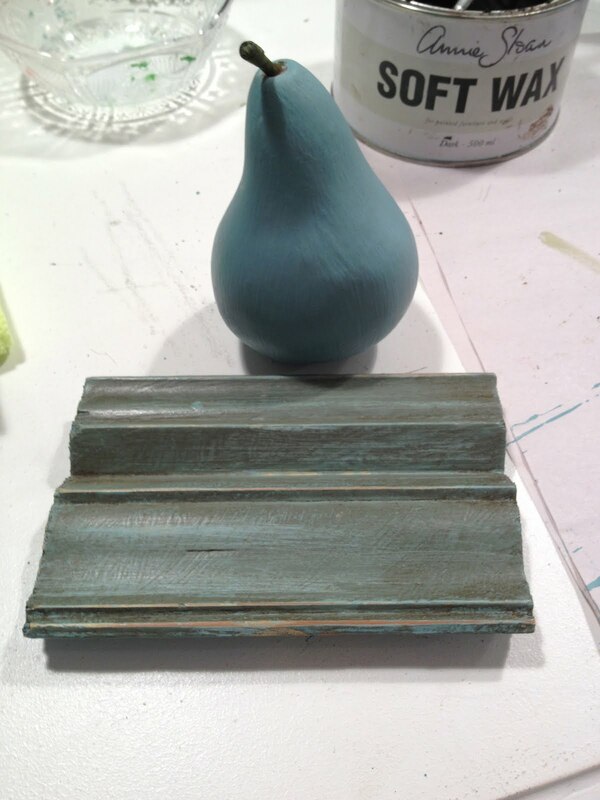 This is what I love most about Chalk Paint™. You can paint on absolutely anything and these decorative hooks took to the paint as any refined hook would do given the same opportunity! How about Florence with Antoinette and a little distressing and some dark wax? And then there is the regal beauty of a Primer Red with some dark wax and a distressing. 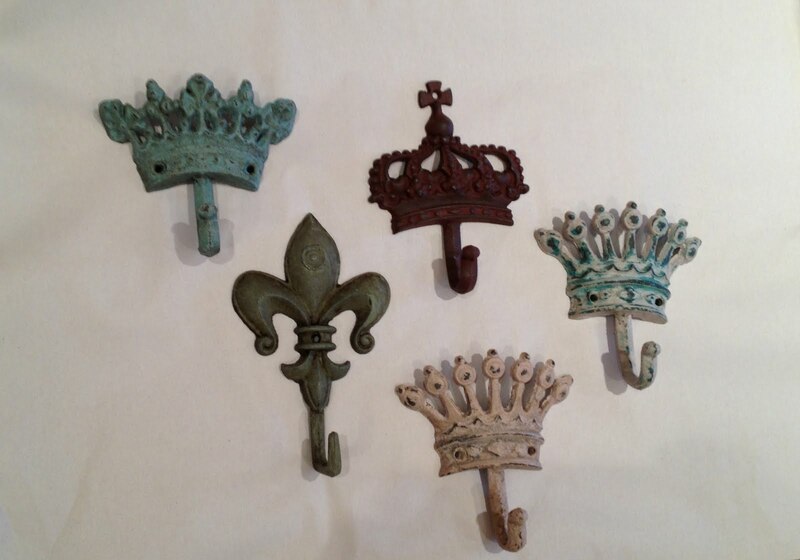 A Fleur-de-lis with Chateau Grey, a little distressing and softening with dark wax is pure elegance. And who does not love Provence in any form? Here it is ready to hang in the warmth of a little distressing and dark wax. And here is Antoinette in all her beautiful subtle refinement. I love the warmth of the dark wax and a little distressing to give this piece an extra charm. At the ending of the workshop we all shared our information on Pinterest and Facebook. There will be more pins to pin and more friends to add to all of our pages and isn't this the best way to begin a January that at the onset seems a little calm and remote from families and friends where the miles may seem a bit long. 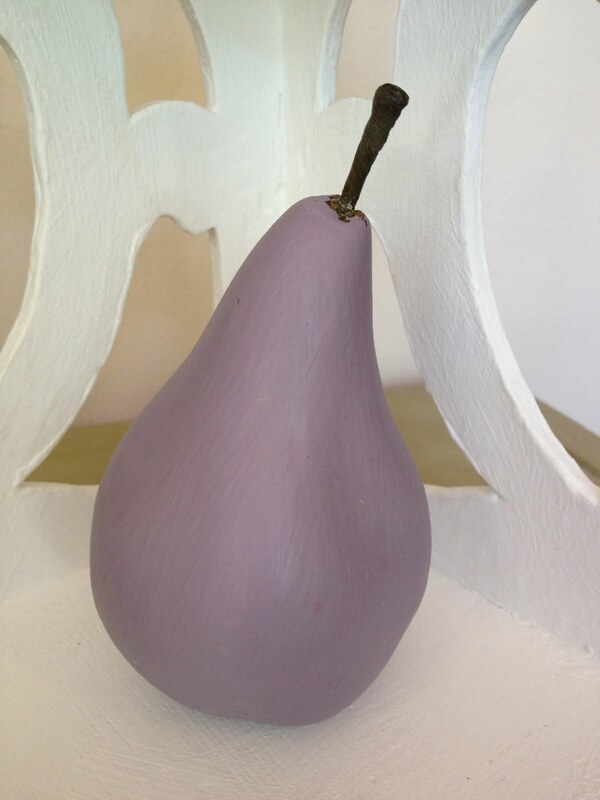 I am warming up to a wonderful year at The Purple Pear. The wind may seem cold and the temperatures chilly but there is much to warm our hearts and keep our creative pulses beating. Our favorite bakery was at Pine and Fillmore, La Boulangerie. 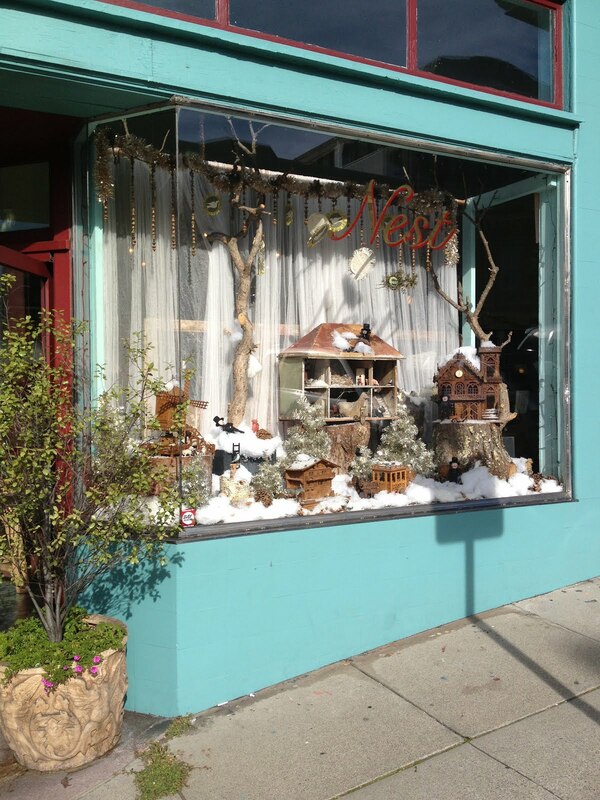 And Nest, my favorite boutique for home decor and inspiration was on Fillmore Street and Washington. If you have a chance to visit the bay area don't miss the chance to visit this magical place. 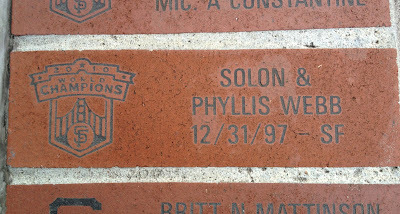 On our anniversary, the 31st, we headed over to the SF Giants Ball Park to see the brick we had to commemorate our place of marriage in San Francisco and to memorialize our years there together. We were given a small bowl of fruit from the hotel and I had to take a picture of it. The stem was so wonderful, such a statement. Grace Cathedral is in the background. From the time we arrived until we left the weather was spectacular. This was a view from our room. The Flood Mansion is in the forefront, now the Pacific Union Club. On the way north we headed up through Mendocino and The Lost Coast, Humboldt County. We stayed at The Benbow Inn. I could spend hours on their front porch even though the weather was very cold and foggy. This inn was built around the 1930's and has the most amazing collection of antique furniture. I went around taking a few photos. This hall tree was on the second floor near our room. This detail barely does it justice. I was so drawn in by the beauty of it every time we passed by. This amazing statue was of an angel in flight holding a hot air balloon filled with people. 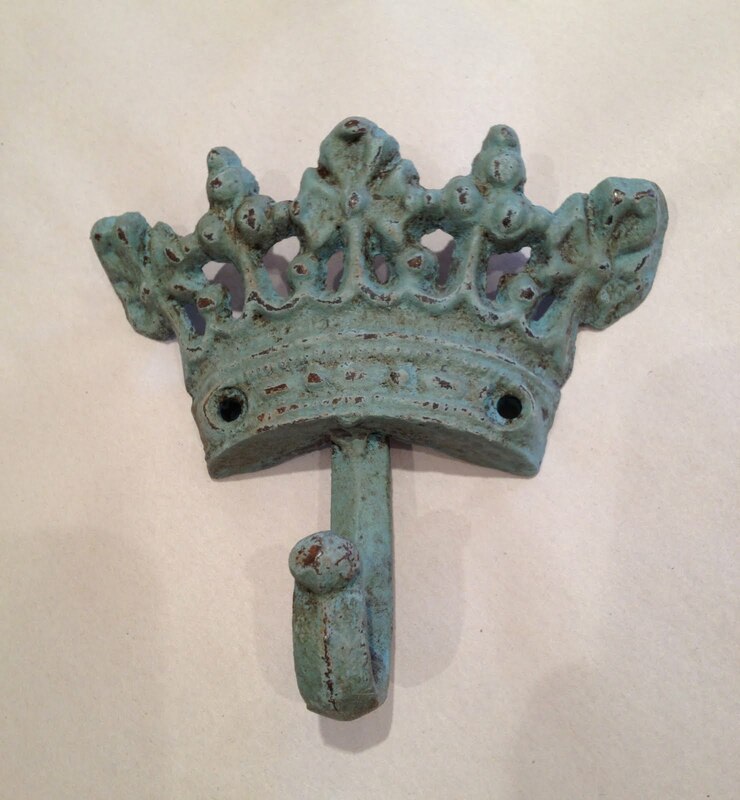 Where in the world did they find these incredible pieces? And what about this beautiful swan table with the intricate carving? 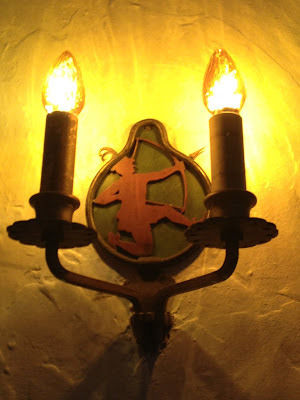 I think they had the most original and lovely light fixtures I have seen in some time. This fixture was actually a standard one seen through out the hotel. We are back in Portland now and returning to The Purple Pear in the morning. I can't wait to re-do the store and update the look for 2013. Happy New Year!! The day before we left LA, our daughter wanted us to see an outdoor exhibit at the Los Angeles County Museum of Art. 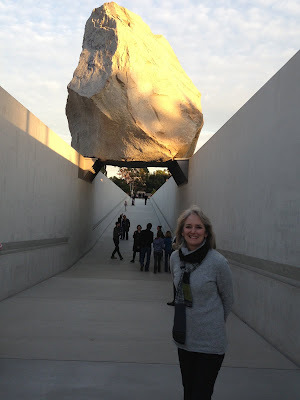 She described it as a huge displaced mass of rock (boulder?) 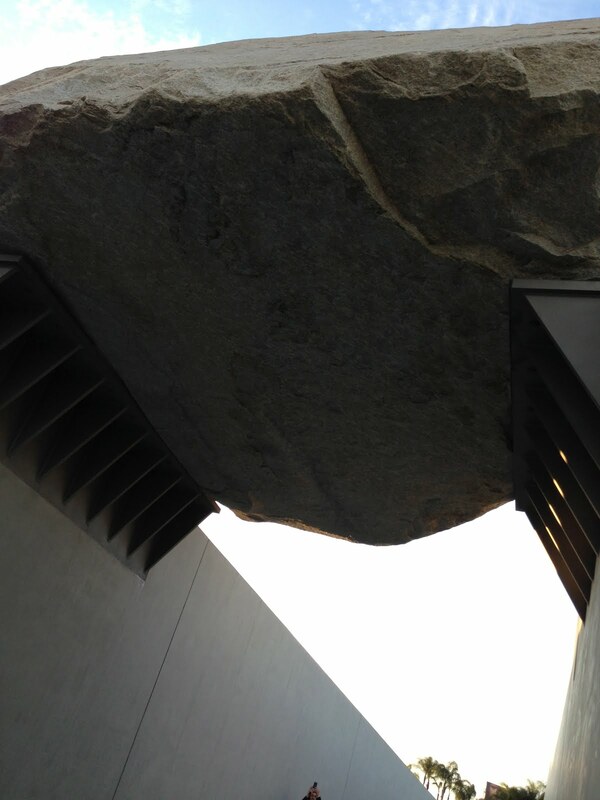 that was poised over a structure that one could walk under. It sounded strange and fascinating at the same time. 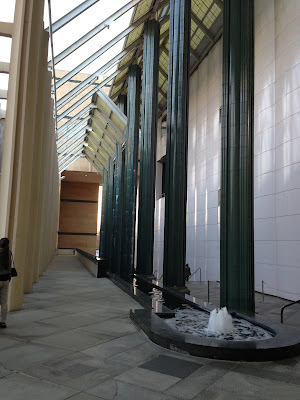 The grounds and buildings of this museum are energizing and contemporary, fitting and appropriate for a city that sets trends in fashion as well as design. When I approached this "rock" I was astounded, not only about the size and mass, but the way it had been set above this passage. The dimension of it as well as the feeling that it conveyed was one of awe and reverence. How something so massive could seem so majestic and balanced. 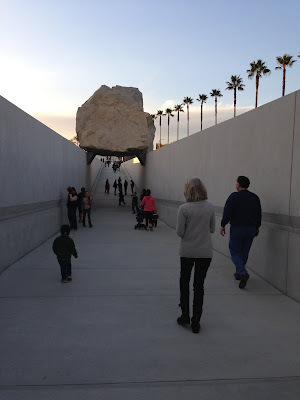 My grandson and I are standing next to the mass that is set above the tunnel, so you can see how massive this structure is in comparison to our sizes. As we walked up to the museum there was another outdoor display with strings of yellow tubing, a visceral and tactile change of experience. Jeanette, my daughter is in the foreground with her youngest son, and I am in the background with her oldest son. It is funny how this kind of experience seems to create a feeling of inclusion and security. What a memorable experience this was for us to have as individuals as well as a family. And it reminds me how important it is to support our museums whether they are local or distant. The art is there for us to experience and whether it is visual or interactive, it is a gift for us to embrace. It is a time to feel and reflect and memorialize the experience. And it is always within our reach. It is an opportunity to recall and remember this gift as we approach a new year knowing that art is the one constant in our lives in a world that is in constant flux.